Growing your plants from clones is simpler and quicker in comparison to using seeds. However, cloning plants is no easy task and require experience and skill. Using the best cloning gel ensures that there is a large number of stems growing into healthy plants. Cloning gels are particularly designed with vitamins and hormones to provide the young stems with tools for fast rooting. The faster the stems develop the rooting system, the more successful the cloning. Lack of skill and experience in cloning results in low chances of success. There are many types of rooting hormones and cloning gel is one of them. It is therefore important to use the best cloning gel on every one of your stems every time you clone to increase your chances of success. The proper use of rooting hormones will considerably increase the chances of having a healthy plant. Rooting Hormones assists the recovery of the stems from cutting, and help in the quick development of the roots. In addition to significantly increasing the chances of a successful growth, it saves your time and money in the long term. Your plant is more vulnerable to illness without rooting hormone, and their roots will take longer to grow. A large number of rooting hormones are suitable for a range of different garden safe plants such as orchids, cannabis sativa or any plant capable of propagating clones. Our review focuses on rooting hormones suitable for use on different plants. The Hydrodynamics Clonex Rooting Gel maintains contact with the cut stem, closing the cut tissue. It also supplies the necessary hormones for the development of the root, in addition to vitamins for the protection of the delicate young root. 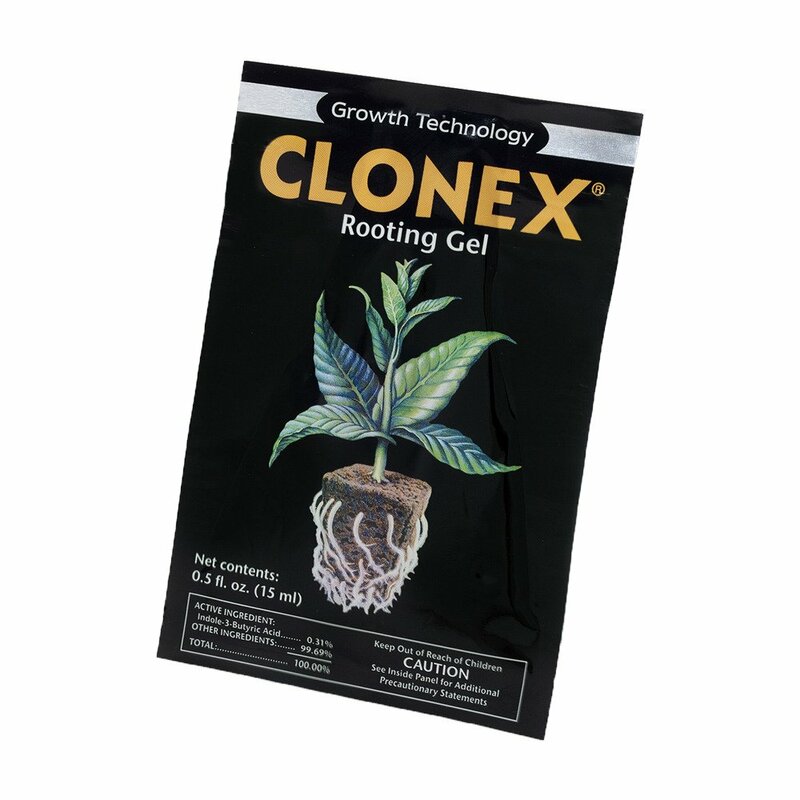 This cloning gel has a full range of nutrients, minerals, and rooting hormones for the nourishment of the developing roots.This cloning gel is particularly useful if you have a large number of plants that require cloning. It comes in 100mL bottles but you can also select a 500 mL or 1000 mL bottles. The cloning gel is therefore capable of lasting if you do not use it all up at one go. Furthermore, this rooting hormone is water based unlike Dip N Grow Liquid Rooting Hormone but is capable of high performance in the development of young roots. It is also appropriate for use on a wide variety of plants including food crops. This rooting gel is available in two sizes: a 75 mL bottle suitable for home growers and a 250 mL bottle for those with a bigger operation. The Quick Clone Gel is simple to use in the cloning of the healthiest and fastest growing plants. It eliminates the challenges of having weak and slow growing seedlings. You can, therefore, anticipate best growing clones with stronger roots. As a result home growers expect increased yields and for larger operations increased profits making it suitable for all kinds of gardeners and is also garden safe. The Quick Clone Gel does not have the active ingredient contained in Clonex Rooting Hormone or Rootech. As an alternative, contains ingredients such as leaves, herbs, and barks brewed in an organic tea for the development of the root and is one of the best rooting hormones on the market. The organic solution does not have any dye but fortified with over sixty ingredients that include a variety of hormones, vitamins, amino acids, and vegetative nutrients. If you are looking for an organic solution then consider using the Quick Clone Gel; however, its price is higher in comparison to other rooting hormones. Being one of the strongest rooting hormone on the market, Technaflora has a strong formulation of vitamins, hormones, and nutrients that stimulate the quick growth of a healthy root. The gel is thicker and smoother to prevent the burning of plant tissues and developing roots. It is a water based rooting hormone like Clonex and if you are looking to use it over a long period, you can easily dilute it with water for use with plants that are easy to clone. The rooting hormone is packaged in a small tin containing 7 grams of gel. This is the smallest available size but 56, 112, or 224 grams tins are available if you want more cloning gel. The gel has an rooting hormone ingredient, a 1H-indole-3-butanoic acid that is higher in concentration than in Clonex Rooting Hormone. The high concentration in Rootech enables the dilution of the gel with water in addition to making it stronger in providing clones with the necessary nutrients for root growth. If you are looking for the cheapest and most nutritious rooting hormones, then consider the Rapid Rooter Plugs. They are strengthened with best hydroponic micronutrients for the rapid growth of the roots. The plug contains optimal water to air ratio, which is necessary for the early development of the root. 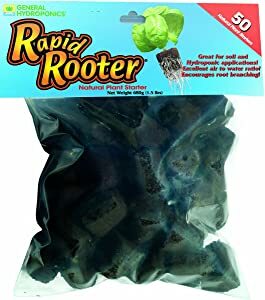 Undoubtedly one of the best rooting hormones and is particularly effective if you wish to grow your plant cuttings hydroponically and seek to take advantage of early rooting for the rapid growth of your plant. Moreover, it is particularly good for cannabis growers in states that marijuana is legal. It is quite economical to use it in germinating cannabis seeds with 100% sprout rate. It is important to note, however, that these plugs are mainly intended for clones rather than seeds but there is no harm in using them for seeds as well. They provide a natural solution to raising your clones. This combo package is particularly useful if you are looking to save cash since it comes with a jar of Rootech Rooting Hormone and Grodan Rockwool rooting cubes. The jar of a Rootech gel is 0.25 ounces and 1.5” inch Rockwool rooting cubes. This exclusive cloning combo pack is simple to use with most cuttings developing roots between 5 and 14 days. It is the perfect combination if you are looking to clone your plants and stems. Despite the Rockwool and Stonewool being particularly popular for the development of clones and seedlings, it is important to take extra care when handling them. Gloves or dust mask are necessary when handling it to prevent the tiny artificial fibers from entering your lungs and skin. They do not provide a natural solution to raising your clones. 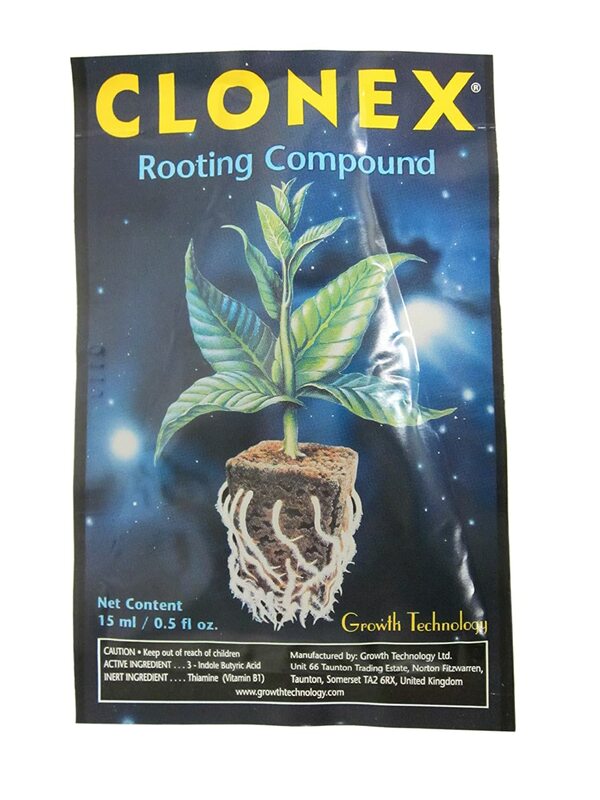 The Clonex Rooting Hormone ensures the rapid development of roots on stem cuttings through the supply of vital hormones and minerals required for the enhanced development of the roots. It is suitable for use on a wide range of cuttings including herbaceous, woody, vegetables, fruit trees, and small fruits. The gel is highly tenacious and surrounds the stem, sealing the cut tissue while supplying the necessary hormones required for the development of the root cells. In addition, it provides vitamins that protect the delicate root tissue. It comes in a 15 mL packet but it is possible to get larger packets if you are looking for a long-term use of the rooting hormone. In addition to the gel, it comes with a pipette that enables the application of the gel to the stem. The wide range of nutrients and trace elements help in the nourishment of the roots at a young stage. It can also be diluted with water (liquid rooting hormone) for application to plants that are easier to clone. 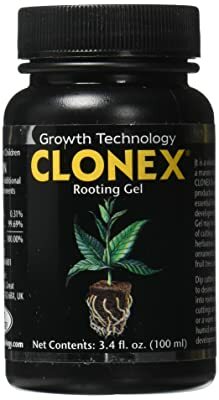 The Clonex cloning gel has been at the helm since its introduction becoming the most popular rooting hormone since the fall of the Berlin Wall. Most growers will not fail to mention the Clonex name when discussing cloning products from other companies. This is one of the best rooting gels fortified with hormones for root growth, vitamins for protection and nutrients. The gel formula surrounds the stem to provide protection as the ingredients provide the necessary nutrients and hormones to the plant. If you are looking to clone only a few cuttings or plants, the small 15 mL packet may be suitable for you. It is particularly useful for home growers who might stretch its use over a long period even when applying a generous coating to every stem. However, for larger operations it may be necessary to look for other rooting hormones providing larger packets such as the Hydrodynamics Clonex Gel Rooting. It is imperative to determine the type of rooting hormoe you want. Is it water-based or organic? Liquid rooting gels are considered as the best cloning gels since they can be easily applied to plants that are easier to clone. In addition, it is possible to use them over a long period due to easy dilution with water. However, if you are looking to go the organic way, there are rooting hormones with organic solutions made from brewing natural ingredients of herbs, leaves, and herbs that provide a wide range of natural hormones, vitamins, and mineral nutrients for the development of the root. When you buy a rooting hormone, you will want it to last for a long time. In addition, you will want it to be equally effective over that period. Different rooting hormones come with varying packages and sizes. The concentration of these gels also comes into play for their durability. For example, liquid form gels may last longer than organic gels due to dilution. A rooting hormone that has a small packaging will require frequent buying that adds to your overall costs in comparison to one with a larger packaging. Not all rooting hormone are suitable for use on all plants. There are gels that are suitable for all kinds of plants whereas others are suitable for particular plants only. Selecting the right cloning gel may prove vital to the successful growth of healthy plant. Same time, choosing the wrong one may prove quite costly in the end. For instance, the plugs are particularly effective for use with cloning cannabis sativa seedlings. All home growers and professional growers look for rooting hormones that constantly provide the stem with the required nutrients and hormones required for the rapid development of the root. The best cloning gel will additionally properly cover the stem and have a wide range of nutrients available. Thicker cloning gels provide effective cover to the stem and properly seal the cut tissue in comparison to thinner gels that are likely to wash off resulting in an unsuccessful growth rate. There are an increased number of people looking to improve their growing chances by using rooting hormones. The first advantage of using cloning gels is the improvement of the growth chances for your plant. This is mostly due to cloning gels providing up to 100% success rate in sprouting of the roots. Additionally, if you use a cloning gel successfully, your cloned stem is likely to grow into a healthy plant. This is because the gels provide the necessary nutrients, hormones, trace elements, and root growth nutrients required for the rapid development of the new roots. Moreover, you save your time and money by reducing the chances of an unsuccessful produce. Cloning is not an easy task and the likelihood of achieving a one hundred percent success rate is likely to be troublesome. As luck would have it, the use of cloning gels has made it easier for growers, both home and professional. It ensures that a large portion of their stems develop new roots and grow into healthy plants. The best rooting gel ensures that your stems do not turn into dead twigs sprouting from your stem. It provides the necessary hormones, nutrients, and vitamins for the development of the root. Based on our review, the Hydrodynamics Clonex Rooting Hormone, 100 mL should is one of the best rooting hormone. It is the best water-based cloning gel with increased durability, the effectiveness of application, and usage with a wide range of plants. 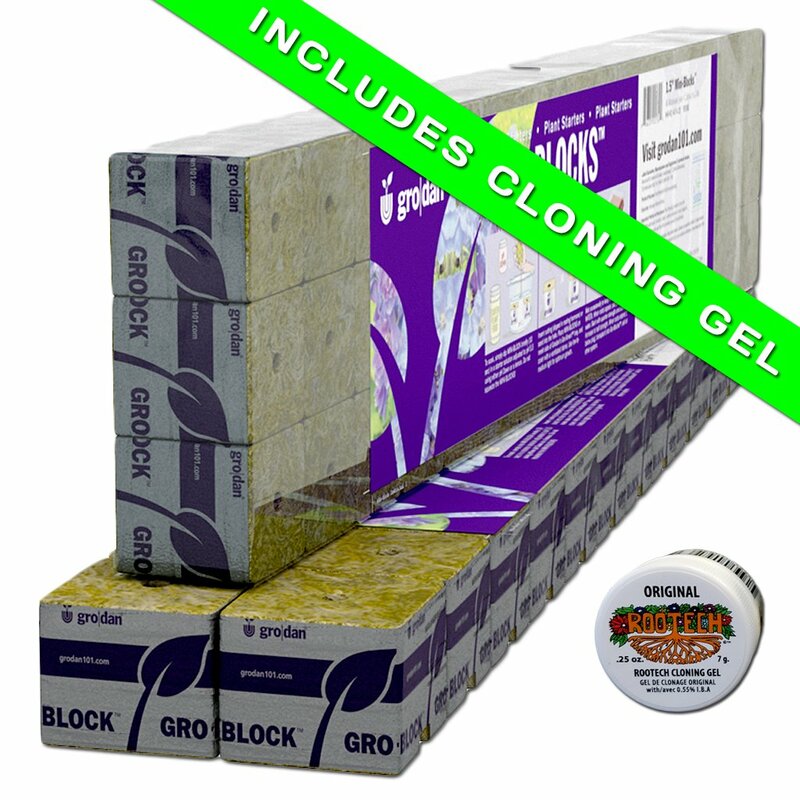 If you are serious about growing healthy plants then using a cloning gel only makes so much sense.